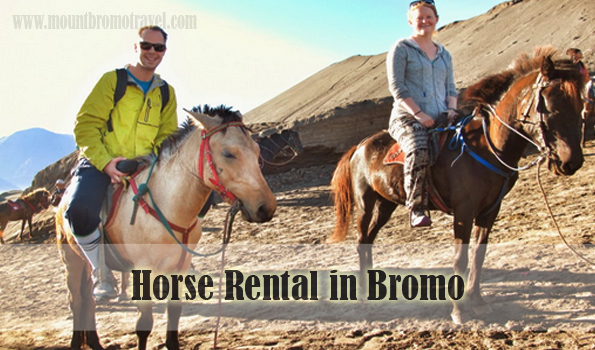 Experience the Unique Horse Rental in Bromo. Horse rental in Bromo offer you the unique and experience that memorable. By passing the clear sea sand, on the way of the Mount Bromo ridge and watch the Bromo sunrise, it offer you a breath taking moment in your holiday. Forget the cold air that available to reach around the 10 degrees Celsius because this is time when you can start your horse rental in Bromo. 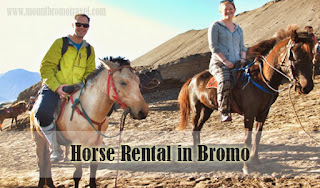 You can find Horse rental in Bromo when you in entrance of Mount bromo. In early morning, the horse rider will gather at horse gathering. In this horse gathering, they will obtain the tourist taking that will use their rental horses to watch object destination in Mount Bromo such as sunrise watch the round crater in outer Bromo. It is located in 8km in short diameter about 15 second from fire explosion. Horse rental in Bromo is easier to find. Do not worry if you want to look for the horse guides, it is easy to recognize them. They usually wear jeans, shoes, leather jackets, and watch around the wrist. They also recognizes from the uniqueness of Tengger tribe, by use local Tengger sarong. Usually they will spoke in Tengger tribe language, or use broken English. Guide by them, you also able to learn about the legend behind the Mount Bromo and the existence of Mount Bromo with row of other surrounded small mountains such as Mount Batok and Mount Penanjakan. The horse rental guide is officially and operated posses with Horse guide Id. They are under the cooperation of Paguyuban Kuda Seaw “ASRI” Cemoro Lawang and under protection of local Government of Probolinggo. Most of them are part time guide where they are farmer that harvest their crop 2 or 3 times a year. The price for Horse rental in Bromo is average at 10.000 to 11.000 rupiah. Rental a horse is great alternative when you climbing Bromo crater and do not want to feel tired with walking in hiking trail. The rail for the bottom of hiking is too slippery, steep and rough. Jeep will not definitely help you with the trails and use horse rental is the most reasonable one. The horses only have two routes, the Penanjakan hiking trail of until the base of stairs to the Bromo crater. Walk many steps after get off Rom Horse rental in Bromo to get the crater. Many ways to enjoy the mountain Bromo one of them is rent horses, by riding horse, you can go around Bromo until you feel satisfied.